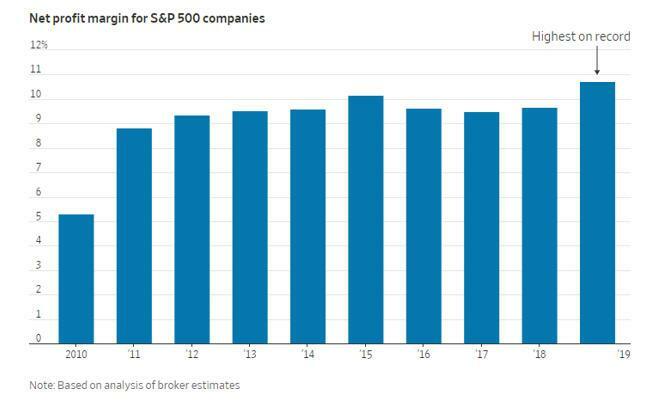 Rising wages and energy costs may start to cut into corporate profit, adding another hurdle to equity valuations as worries of a global economic slowdown have already provided headwinds. Economists expect to see another strong month of wage growth when the jobs report is released Friday, per the Wall Street Journal. The yield curve inversion, wage growth moving near 4%, and tightening economic conditions globally have kept many investors cautious about making stock investments. After a decade-long bull market in stocks, investors are beginning to question the feasibility of the continuation of the current rally. Rising wages and energy costs may start to cut into corporate profit, adding another hurdle to equity valuations as worries of a global economic slowdown have already provided headwinds. Wages grew in February at their fastest rate in a decade, per reports by the U.S. Department of Labor. Economists expect to see another strong month of wage growth when the jobs report is released Friday, per the Wall Street Journal. As wages rise, energy prices have also jumped in recent months after OPEC mentioned production cuts and sanctions on Venezuela and Iran. U.S. crude oil is up 32% year to date through March. James Camp, a managing director at Eagle Asset Management, discusses how wages typically rise in a late-cycle environment. Coupling rising wages with increased energy costs, Camp thinks we may be at peak net profit margins. According to FactSet data extending back to 1999, Q4 2018 margins for S&P 500 companies hit 10.7%, the highest level on record. Another concern for fund managers, according to the Journal, is the expansion of global supply chain companies like Amazon (NASDAQ:AMZN). This has made it harder for certain companies to pass on their higher costs to customers. From a different perspective, this does help control inflation, which makes the Federal Reserve's decisions more dovish, and more investments are being made in riskier assets like equities. Many factors point toward a squeeze on equity valuations. The yield curve inversion, wage growth moving near 4%, and tightening economic conditions globally have kept many investors cautious about making stock investments. Despite easing tensions between the U.S. and China, the asset class as a whole may be too overpriced for investors to consider buying in at this point. While many economists think equities are due for a correction, one can never predict the course of the stock market. Though economists might warn investors to start becoming more defensive, Market Watch mentions April as the strongest month for equities. According to Ryan Detrick, a market strategist for LPL Financial, the Dow Jones Industrial Average was up in April for the last 13 years and the S&P was up in April for 12 of the last 13 years. The first quarter of 2019 has definitely been a strong one; investors are now looking for what's to come in the rest of the year. Sectors: The average momentum score for the Sector Benchmark ETFs increased from 16.91 to 22.00. Momentum increased for eight of the 11 sectors last week. Industrial increased the most, jumping 17 points from the eighth to fourth spot. Technology remained the top sector, while Real Estate overtook Utilities at the second position. Factors: Among the Factor Benchmark ETFs, the average factor score increased from 16.08 to 22.50. Momentum increased for all factors last week. The score for High Beta increased the most, gaining 12 points. Quality and Growth overtook Low Volatility for the top two positions. Fundamental, Small Size, and Value remained at the bottom three positions. Global: The average Global Benchmark ETF momentum score increased from 13.45 to 19.27 for the week. 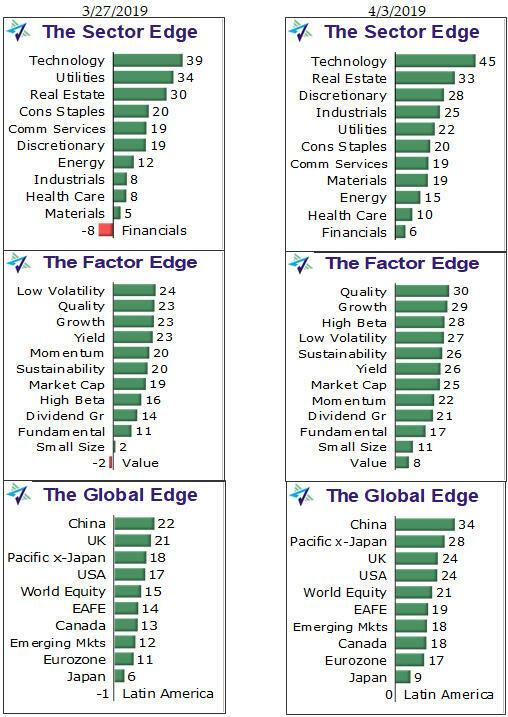 Momentum in the global sector increased in all regions. China had the largest increase, gaining 12 points, after new trade talks began between China and the U.S. China held on to the top spot, while Japan and Latin America remained at the bottom.